How do I Perform Jump Rope Cardio? The basic jump involves jumping up with both feet over the rope as it passes by the floor. Jump rope cardio is considered a very strenuous form of exercise. Jump rope cardio is believed to have great benefits, if performed properly. The benefits of jumping rope can extend beyond improving cardiovascular endurance. Jumping rope can help to make you more agile, and improve muscle strength and balance. Jump rope cardio may also help to strengthen your bones. To get the most out of a jump rope cardio routine, you should start slowly and build endurance, use proper form, and invest in good equipment. Jump rope cardio is considered a very strenuous form of exercise. 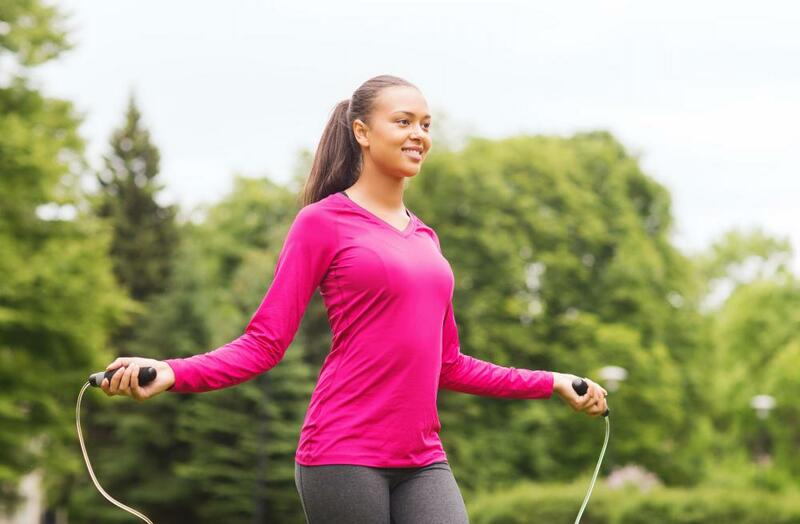 It's generally considered wise to ease into a jump rope cardio routine. If you have never jumped rope for fitness before, you may want to consider beginning with a basic routine that can help you develop jump rope skills. Use a two-footed hop to perform 30 jumps in a row. Rest for 30 seconds, and then perform another 30 jumps. Beginners may want to repeat this sequence four to eight times. Once you are able to jump rope with ease, you can begin a jump rope cardio program. Jump rope for one minute, then run in place for one minute. Repeat this sequence five times for a ten-minute jump rope workout. As your fitness improves, you may find yourself able to lengthen your jump rope workouts. When jumping rope, you may find that proper form is helpful. Practice good posture, and focus your gaze ahead of you rather than down. Keep your arms and shoulders relaxed. Push off into your jump from the balls of your feet, and land on the balls of your feet as well. When you begin a jump rope cardio routine, you don't have to keep the jump rope moving fast. Swing the rope at a speed that feels reasonable to you, and begin your jump just as the rope reaches the floor. As you become more proficient, you may jump rope faster. Before you attempt to begin a jump rope cardio program, you may want to consider investing in quality athletic equipment. Jump ropes, even high-quality ones, are generally affordable and very long-lasting. You may want to consider investing in quality athletic shoes, however, to protect your feet, ankles and joints from the high impact of all those jumps. Before starting any workout routine, it's generally considered a good idea to warm up. Warm up for jumping rope by running in place for about five minutes. It's considered a good idea to cool down afterward, by marching in place for five minutes, or performing some simple stretches. What are the Benefits of Jumping Rope? What are the Different Types of Jump Rope Techniques? What is a Digital Jump Rope? How do I Choose the Best Jump Rope Routine? How do I Perform Boxing Jump Rope Drills? What are the Different Types of Jump Rope Handles? How do I Learn How to Jump Rope?